Bonjour lecteurs! You must know me by now. I absolutely love kids’ fashion! Our first post back from our holiday in Devon was published yesterday and such a success already we decided to spoil you with another giveaway this week! And today with another thing I like! Trying a new product! Plus you will have the chance to win 1 Itsy Blitz Portable Baby Food Blender worth £39.99. Mais, what is it all about, right? Well, our Itsy Blitz Portable Baby Food Blender Review explains it all in details. And I must tell you now… You might want one ASAP! 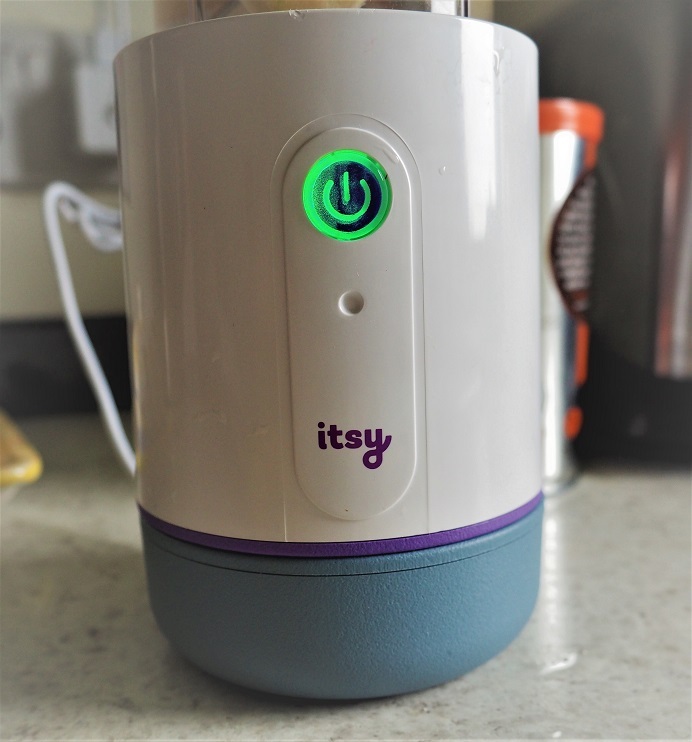 Itsy Blitz Portable Baby Food Blender – What is it? The name says it all! It is basically a mini food blender for you to use on the go with your little one! It has all the features of a traditional blender but smaller! This product is totally new and exclusive on the market so I was very excited to review it before everyone else! This magical item means you can wean your baby when you are out and about! Coming in a colourful and stylish case, it only weighs 540g. Plus it is so compact you can pack it easily in a travel bag or even in your handbag at all times! At the café, in a hotel or even while visiting family and friends, this is such a fab solution to cooking fresh and healthy meals for le bébé! A colourful packaging for some fab food in the making! As soon as it arrives, I was really impressed by it. Plus the bag to travel with it is super cool too! The creator, Chris Grunwell thought about it all! The pack also features adaptors so that you can still use it abroad! You can see that he is a dad! 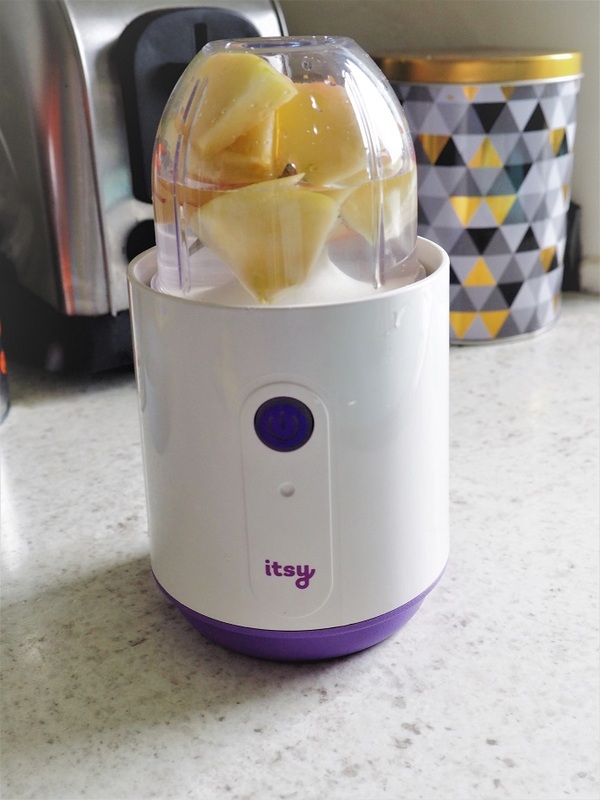 Actually, he designed the Itsy Blitz Portable Baby Food Blender after his daughter arrived! Wherever you are in the world, get cooking! Not only the Itsy Blitz Portable Baby Food Blender is small enough for us to enjoy it while on the go but I can also store it nicely at home! We were fast to try it! Charging it was facile with the base. With the green light on, I knew we were ready to get started! First was a green purée with a bit of avocado. Effectively, due to its size, the portions are quite small. But it was quick to do it! Another thing I liked? It is so secure! Indeed, the part with the blade needs to click before it can actually work. So if it is not safe, it will not start! You can sometimes be in a rush with this kind of things so extra security is good! And it is so safe to use! Because of its straightforward structure (not too many parts), it was also mega fast to take it apart and clean it. Bonus point for this! I hate housework! Next test was on holiday. Again, it charged quickly and we decided to make some compote with it. Powered by micro USB, I could charge it anywhere so easily! I did it all in the kitchen of the place we rented but it could have happened anywhere really! Amazing! Bien sûr, the appliance doesn’t boil food so I had to do it first. But imagine the possibilités if you are out? You can simply mix up whatever you are having yourself and le bébé can taste something new! And if you want some idées, the pack include a booklet with recipes for you to make some delicious food! It was so convenient! Now that Baba is a toddler, I do not worry so much about his food. I know there would always be something for him on the menu. And if the worst comes to the worst, we can only get some baguette and cheese et voilà! hassle free when it’s about cleaning it! it gives you the freedom to feed your baby whatever you like! You can be sure that with it, your bébé will have some healthy and yummy pureed food at all times, wherever you are! It is so simple to use and also to clean! Plus you can even serve the food from the bowl itself if you don’t have a plate! No need to have a pouch with you! Your little one gets guaranteed fresh food and you know what it is made off! So no nasties! Plus it is super safe and BPA free. Get your hands on one of those quick! La preuve it is fab? It has been sold out within a few weeks! Plus at a current price of £39.99, it makes my new baby essential! It is so much cheaper than a traditional processor. Why not use it as your main one and not only during your escapades? 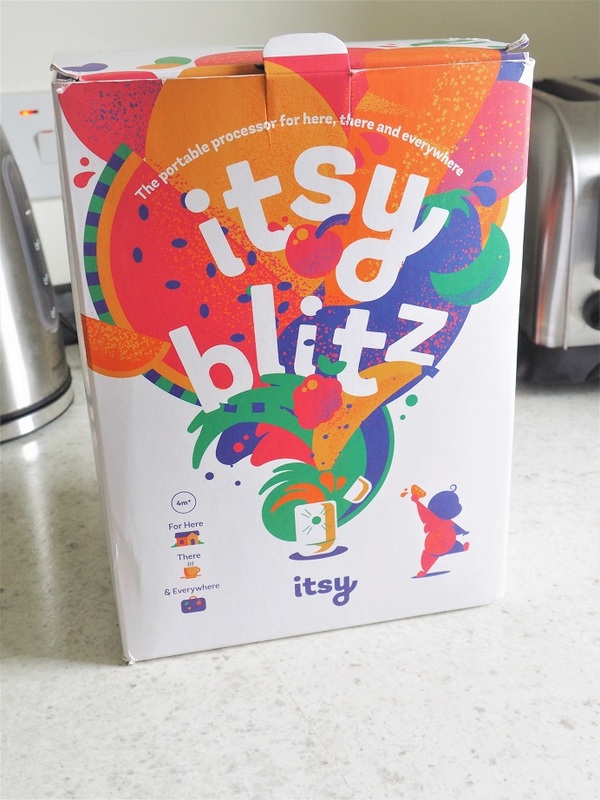 We think the Itsy Blitz Portable Baby Food Blender is such a fab creation! I can’t believe no one thought about it before! Fancy being one of the first lucky parents to try it too? Time to play now! Do you fancy this fab product? 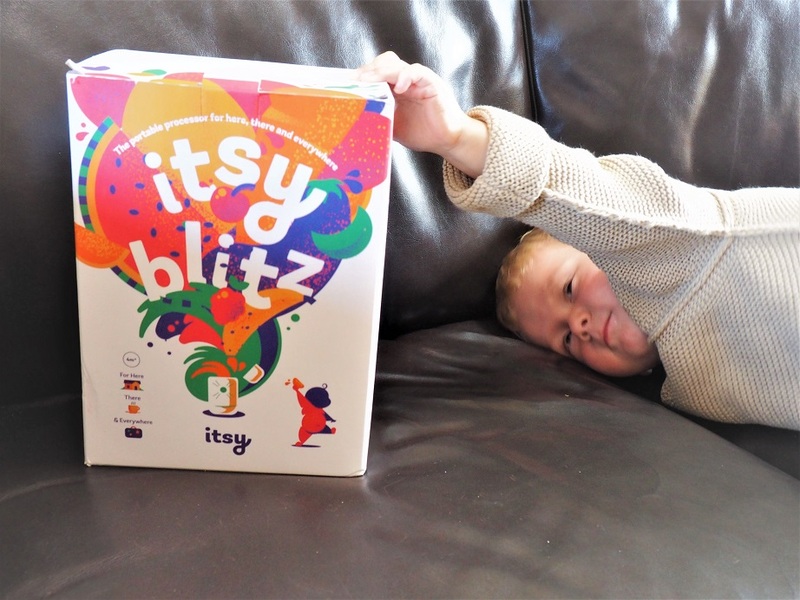 Win 1 Itsy Blitz Portable Baby Food Blender worth £39.99. This giveaway starts on Friday 31st August at 6.30 pm and ends at midnight on the 30th of September. 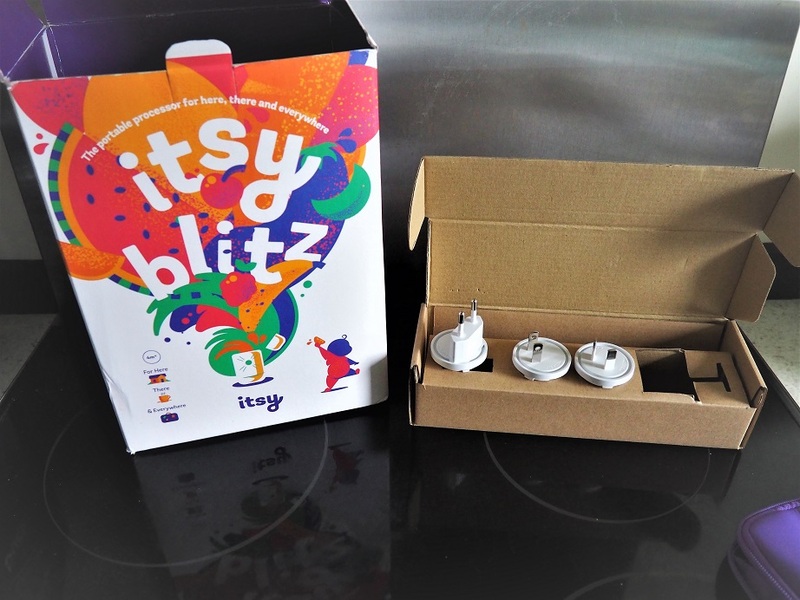 Provision of the prize is the responsibility of Itsy Blitz. Frenchie Mummy can’t be held responsible. 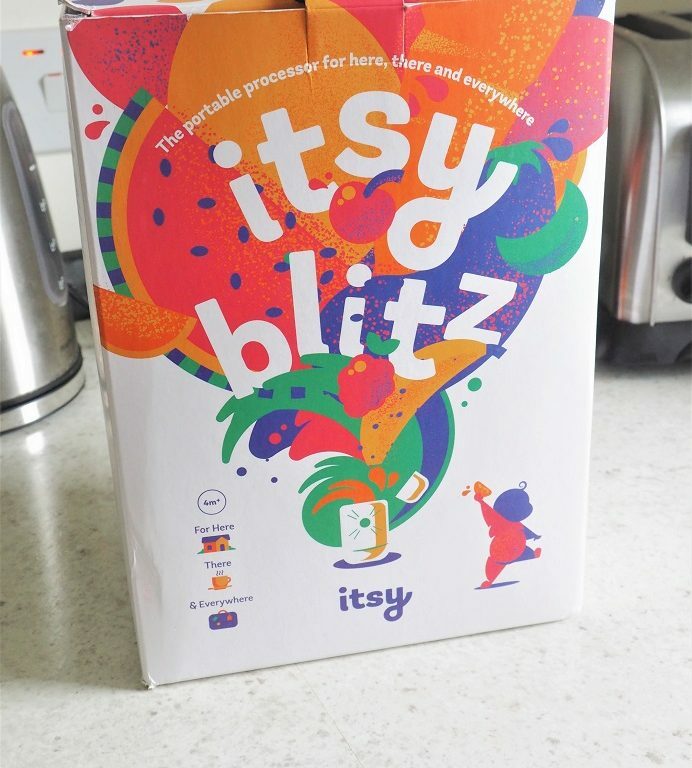 Merci for reading our Itsy Blitz Portable Baby Food Blender Review. 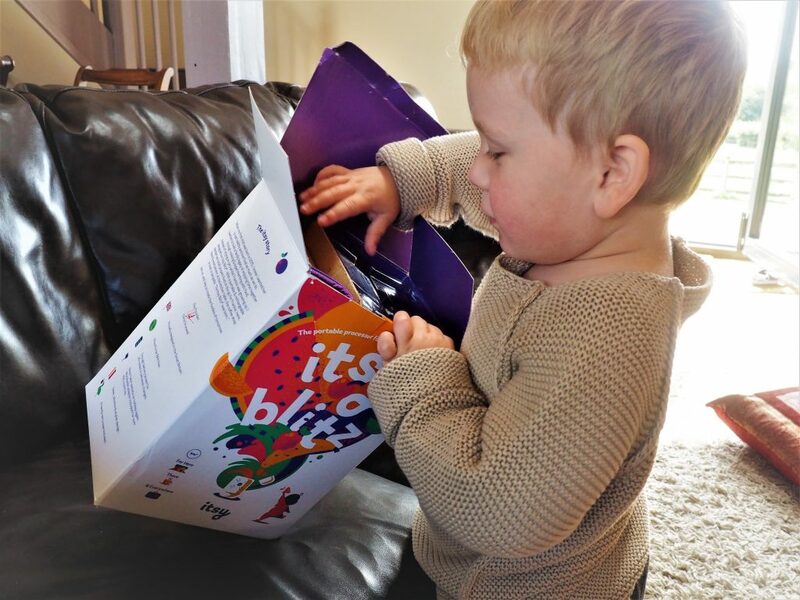 This is such a fab product for parents! Loving what you see? Why not check out our Giveaways‘ section for more fabulous prizes to win with us! And make sure to come back from Sunday as we are about to start a Frenchie Back To School Giveaways Event with some gorgeous prizes for you to win!! Disclosure: This is a sponsored post written in collaboration with Itsy Blitz. we tried banana and she loved it! I don’t remember the first weaning food I used was, does that make me a rubbish Mum? Steamed and mashed carrot was her first solid food and she seemed to enjoy it. He had mashed banana and hated it! my daughter started off on rusks, we first mixed it in with her milk bottles. rusks, although they don’t last long in our house, everyone loves them! Great idea for the blender to come with adaptors so you can use it abroad! Ingenius! Bananas. It was an easy transition from blended. I can’t remember exactly, though watermelon was definitely one of the first, if not the first. This would make the perfect gift for my son and his girlfriend who will be having their 1st baby in February!